Necessity is the mother of invention, as Plato once said. This guiding principal is what prompted Toronto-based designer Adam Fullerton to tinker and toil away with odd ends around the house to create objects that served a function. 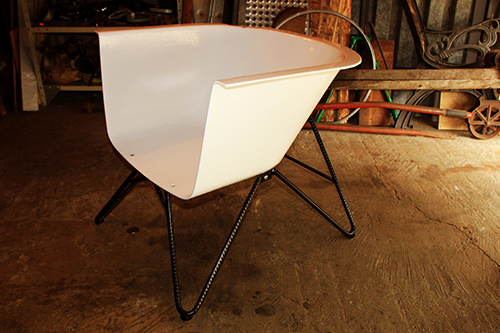 This passion became a business when Adam Fullerton Creative Design and Upcycling was established in 2012. For the West-Sussex born designer, his inspiration comes largely from his travels in Australia, New Zealand and South America; envisioning recycled materials being crafted into beautiful installations. His design philosophy is simple – harvest wasted materials, and once he’s done with them, they become objects of curiosity, style and functionality. As seen in the above picture, Fullerton makes use of salvaged fire extinguisher parts, pulleys and bike parts to construct truly unique lighting fixtures. Bike & Fall Light V2 has an adjustable height range for a well-lit workspace, reading nook, or dining table. The frame is constructed from the rear end of a scrap road bike. 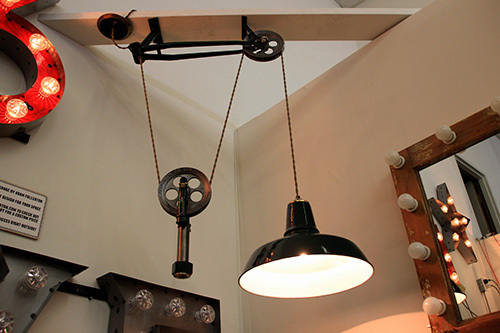 Two aluminum washing line pulleys guide the vintage cord, and a pair of bike forks counterweight the classic green enameled lamp shade. Bath Tub Chairs have been cut from a cast iron bathtub dating back to 1948. 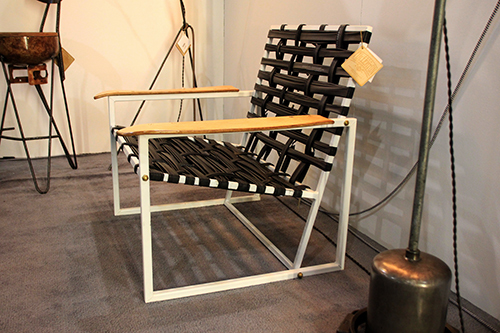 They’ve been sandblasted, primed and powder coated and are suitable for indoor or outdoor use. The legs have been formed from scrap rebar, powder coated in satin black and fitted with leather pads to protect the floor. 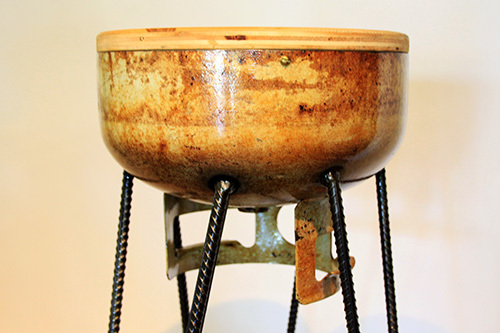 Gas Canister Bar Stools are made from old propane tanks, paired with salvaged rebar. Maple veneered ply tops are fitted on to the tanks and held in place by brass screws. Tanks and legs are finished in an oil based clear coat, preserving the patina, and leather covered feet will not scratch the floors on which they sit. The stools are available with or without back rests. Contemporary Inner-Chair is made from box section off-cuts and packaging from Toronto’s newest e-bikes, dozens of discarded bike inner tubes, and armrests made of skateboard decks. Fullerton’s fixtures and installations are not only stylish and utilitarian, but also conversation pieces and reincarnations of items often seen as “unglamorous” and disregarded. 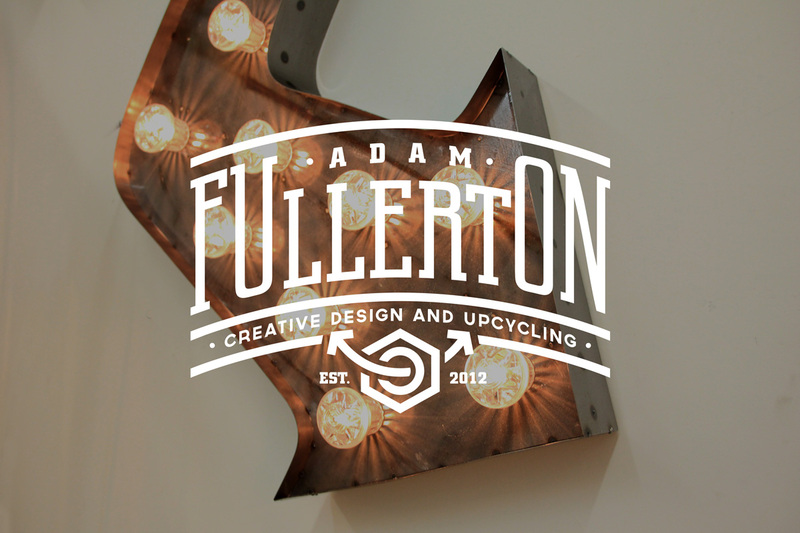 Check out the rest of the impressive portfolio at Adam Fullerton Creative Design and Upcycling.